Morgoth's Ring is the tenth volume of The History of Middle-earth series and the first of the two volumes which focus on the writings of The Silmarillion. Together with its companion, The War of the Jewels, it reconstructs the evolution and transformation of the myths and legends that later became The Silmarillion. In Morgoth's Ring we can witness the changes these texts underwent in the years after Tolkien completed The Lord of the Rings. 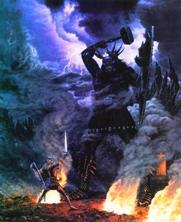 ♦ Morgoth's Ring includes the full content of The Annals of Aman, the "Blessed Land" in the Far West. ♦ Morgoth's Ring includes the writings that discuss such important points as the nature and destiny of Elves, the idea of Elvish rebirth, the origin of the orcs, and the "Fall of Man." ♦ Morgoth's Ring also contains, reproduced in full, The Debate of Finrod and Andreth, Tolkien's thoughts on mortality and immortality, taking as a point of departure, the lives of Elves and Men. ♦ Morgoth's Ring, last but not least, highlights Morgoth's significance and power and how it became (in Christopher Tolkien's words), "the ground and source of the corruption of Arda." It demonstrates how, as Tolkien puts it, "the whole of Middle-earth was Morgoth's Ring."